Sore Losers Gaming - Amateur Devblog: Devblog: Englia: The Wager Finally Released! Devblog: Englia: The Wager Finally Released! I obviously meant to upload this "final" version of the game a long time ago, but that didn't happen for a variety of reasons. 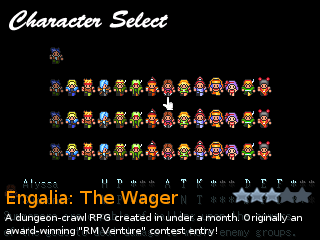 I basically dropped RPGMaker activities half-way through making the corrections/additions I wanted to make after the RM Venture contest finished and never got around to finishing them until now. I'm putting "final" in quotation marks because I'll probably have to update this again once people get their hands on it. There are undoubtedly going to be problems with the game despite the fact that I've taken time to tinker with it. Then again, it's so far from RM Venture finishing that I don't even think people are going to be interested. Oh well. I can guarantee that it is possible to play through to the end of the game, but your mileage will definitely vary depending on the party you choose. There are definitely some classes that are better than others, but that's just the nature of any game like this! Hopefully most people will enjoy it, as simple a game as it is.